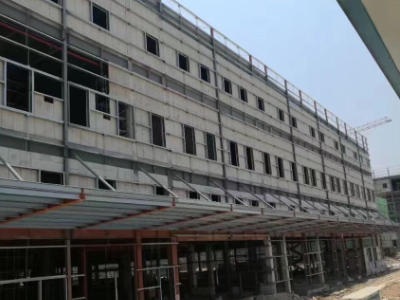 Lightweight wall panel is specific produced for modern building, ecological residence, frame structure and lower building, the birth of wall panel marks the renewal of the wall material, new leap has been made in the modernization of wall materials. 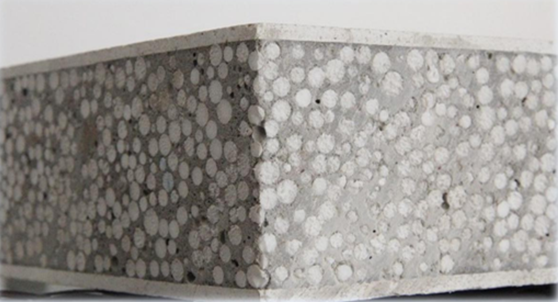 The birth of this product replaces the traditional block process, it meets the wall material requirements with new energy saving and waste building concept, and its excellent performance meets the requirements of the modern building for the wall materials. Lightweight wall panel is not only widely used in various kinds of high and multi-storey non-bearing buildings, but also can be used as adornment panel, fire partition wall, its operation is simple and looks beautiful. 2440mm×610mm×（60/75/90/100/120/150/200）㎜. 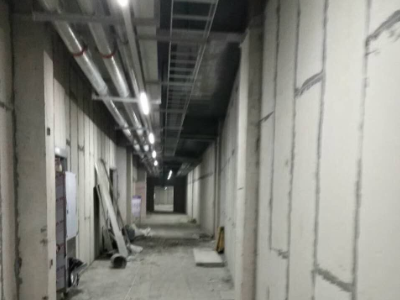 Among them, the internal wall use the thickness of 60 ~ 100 ㎜ wall panel, the outer wall use the thickness of 120 ~ 200 ㎜ wall panel. 2. Environmental Materials: no pollution during production. 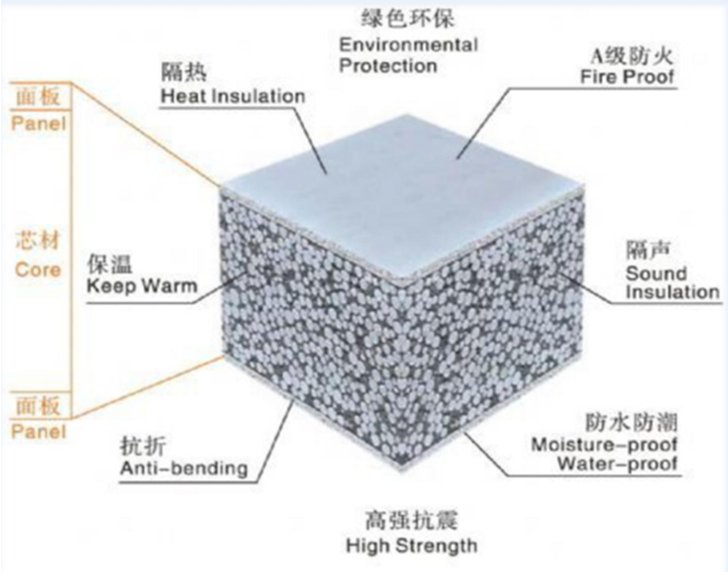 All materials of the wall panel are without harmful substances and radioactive substances, reusable, It does not produce the construction waste, widely used in various places. 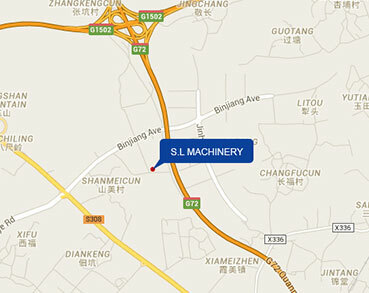 It is conform to the State Standards for Radiological Protection of Building Materials(GB6566-86), it is a green product. The lightweight wall panel has special properties, so the moisture-proof and water-resistant features are particularly prominent. The experiment proves that the wall panel can be used as tank with water without making any waterproofing. The back of the wall can remain dry without any trace, and it does not appear the water bead in damp weather. 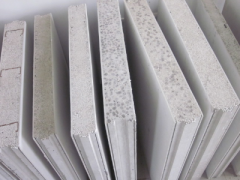 Lightweight wall panel weighs 1/6 of a typical 120mm thick block wall, therefore, it can reduce the weight of the structural wall, and to reduce the base load of beam column and any compartment in the room. 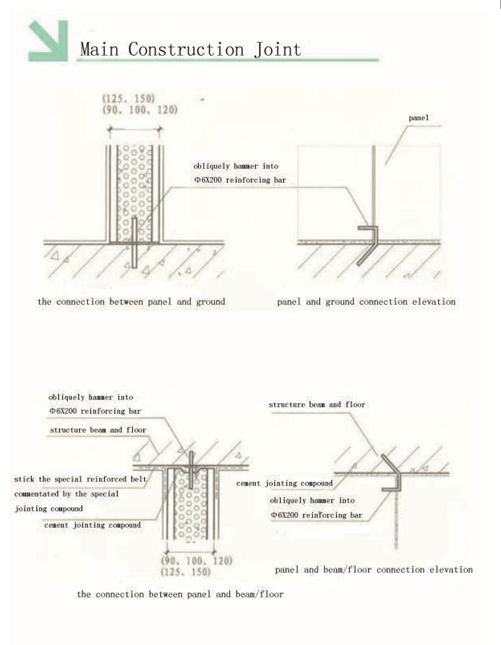 A building is reduced by 180-200 tons per 1000m2 (3 meters in height). 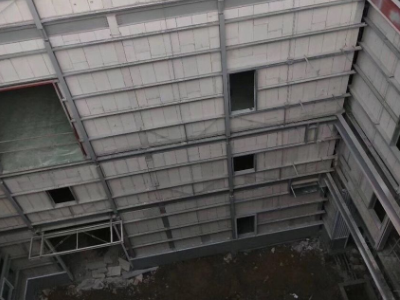 If the height of the building is more than 3.5 meters, the thickness of the block wall should be increased to 200mm, then it can reduce 600 ton per 1000m2. 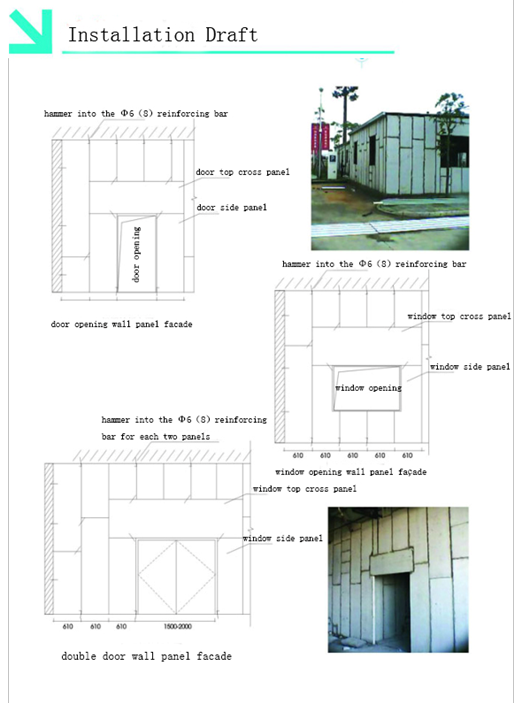 The use area are greatly increased and save the use space compared with the thickness of traditional block wall . The wall panel has a high level of flatness , no need plastering, and the height is customized according to the actual construction size. 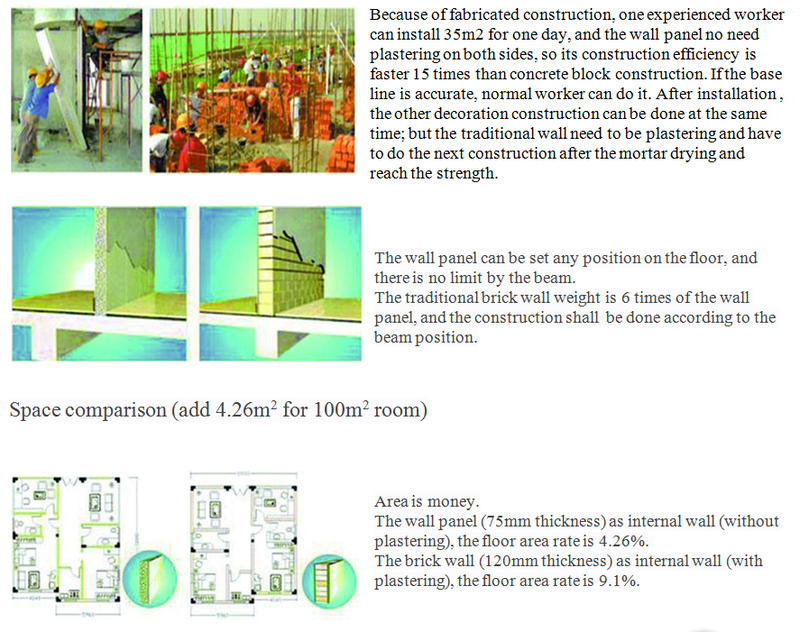 Special dimensions can be cut at site, The wall panel’s construction progress can be increased by more than 20 times, which compared to the clay solid brick and the small piece of the hollow block. 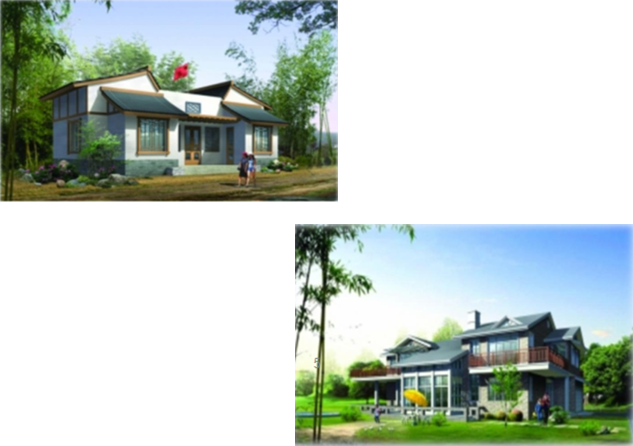 It can greatly shorten the construction period and improve the efficiency of investment. 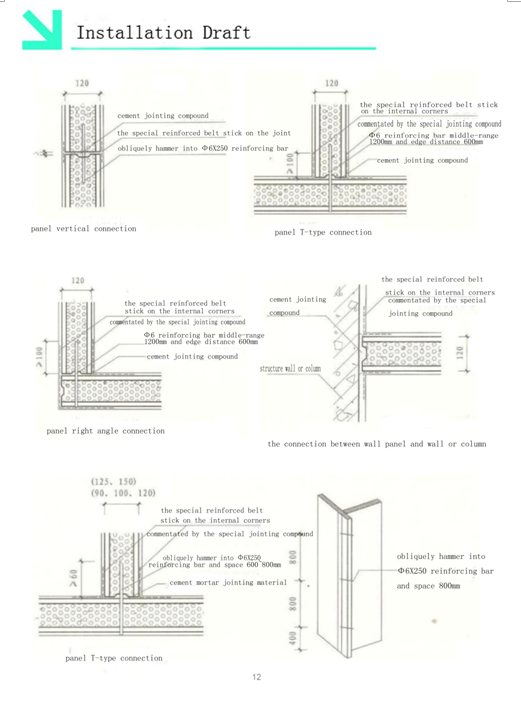 The products of wall panel can be drilled, sawn and nailed, and the size can be adjusted freely, so it is more convenient for the installation and embedding of water and electricity pipes than other wall panels. 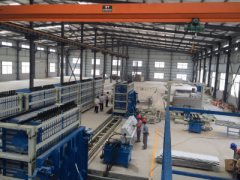 The lightweight wall panel is a three-in-one structure because of the assembly construction. 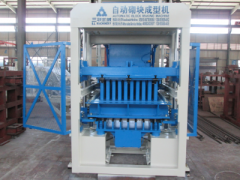 The wall panels are connected to the whole, integrity is better, anti-pressure and earthquake resistant, and the test impact performance is 1.5 times of the traditional block. 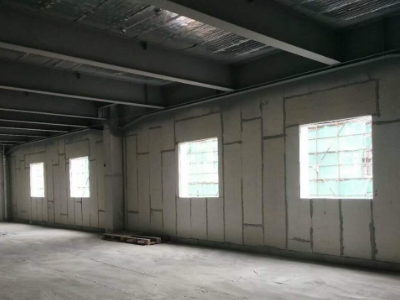 The wall panel connected with the steel structure or concrete frame through anchoring, block parts, fittings etc. 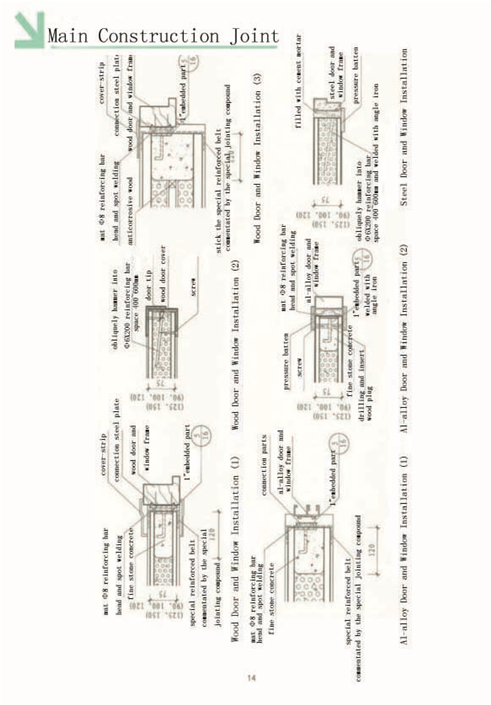 The overall earthquake resistance performance can be satisfied for level-8. 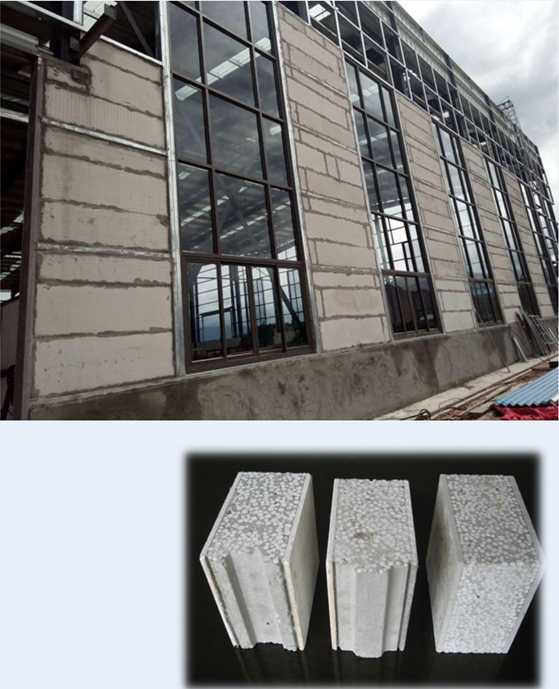 The strip is stronger, which compared with the traditional block walls with more contact points, and it is more likely to form the triangle saving area in the earthquake, reducing the casualties, and the earthquake resistance and impact performance meet the national standards. 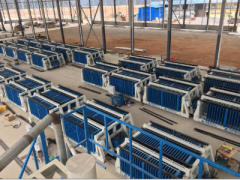 From the increase of practical area, lower transportation cost, labor saving, structural cost reduction and construction, the cost is very cheap. The wall panel can be called free wall panel since each construction of 12 meters extension wall board can increase the 1 square meter use area. Each 10-12 meters wall can increase one square meter use area and increase the utilization rate by 50-10.For every 100 square meters of residential or store, there are extra 4-6 square meters for using. The wall is flat and beautiful after the joint treatment, and it is easy to make decorative surface processing. 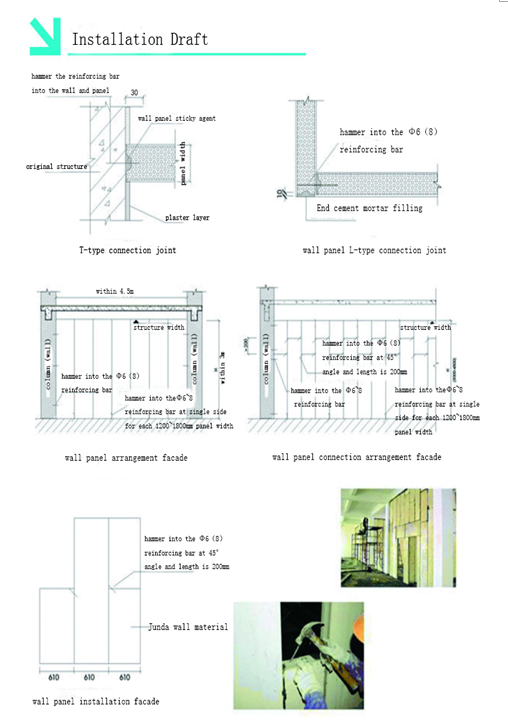 All kinds of nailing, drilling, slotting and pasting can be implemented on the wall. Paste decorative wall cloth, wallpaper, all kinds of wood sheet adornment board, plastic sheet, aluminous plastic board, ceramic tile, marble material can be pasted with relevant paste material directly without plastering. 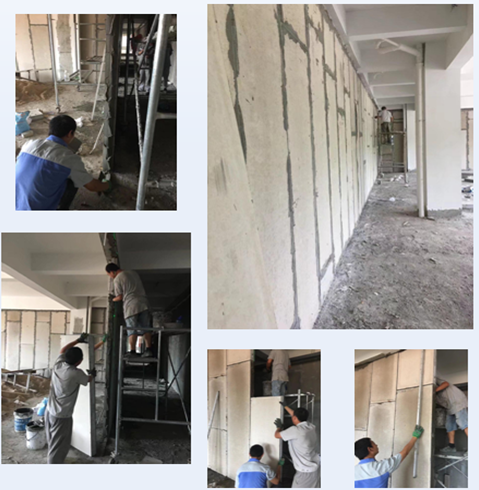 Wall panel can be used with the construction sand, cement paste and other adhesion, wall decoration and tile pasting with no special treatment. 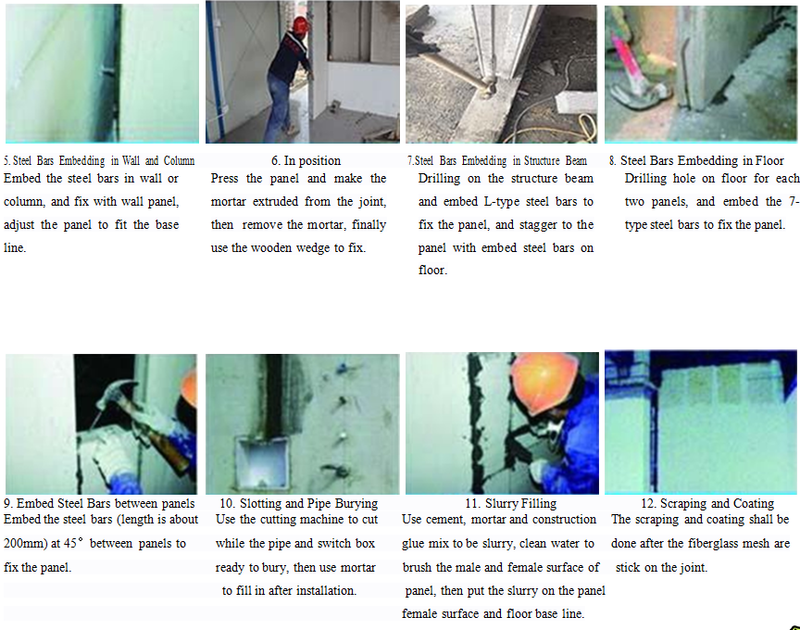 Any part of wall panel can be nailing, drilling, to install expansion bolt, the single point hanging force is more than 50kg. It is the only one of the most powerful wall panels in the current lightweight wall panels. The wall panel house, which is a revolutionary new product for small and medium-sized buildings, the weight of wall panel house is only 1/6 to 1/8 of the brick structure, so it has the outstanding performance in seismic energy conservation, among them, the anti-earthquake is more than eight degrees fortify, and it can reach the national standard of energy saving of 65. The construction is easy, the economic performance is improved.